Abstract: Sir Thomas Malory’s Le Morte Darthur is a text that tells the story of King Arthur and his Knights of the Round Table. 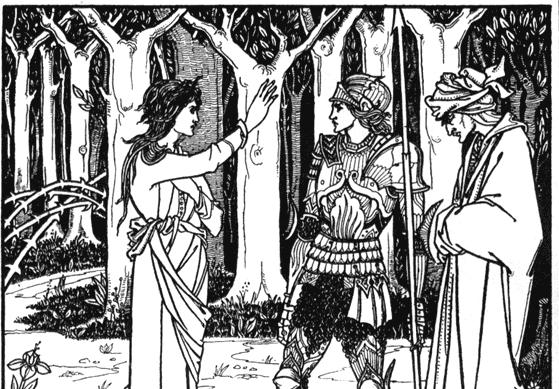 Malory wrote this tale by synthesizing various Arthurian sources, the most important of which being the Post-Vulgate cycle. Malory’s work features a division between the Christian realm of Camelot and the pagan forces trying to destroy it. Throughout the thesis, I use a variety of scholarship to examine magic and argue that magic is as essential to the plot of Le Morte Darthur as Christianity is. In chapter one, I review the existing literature that is available on Medieval magic and I show where the gaps in the literature are. In chapter two, I examine men and magic and how masculine magic is beneficial while female magic is antagonistic. I focus on Launcelot, Galahad, and Merlin. In chapter three, I examine how female magic users fit into the paradigm of masculine-female magic; I use the characters of Morgan Le Fey and Nynive. Chapter four focuses primarily on magical creatures and objects and how they represent paganism and Christianity. It the goal of this thesis to show how magic and Christianity form a symbiotic relationship in which both are reliant on each other in order to be successful in the medieval romance.